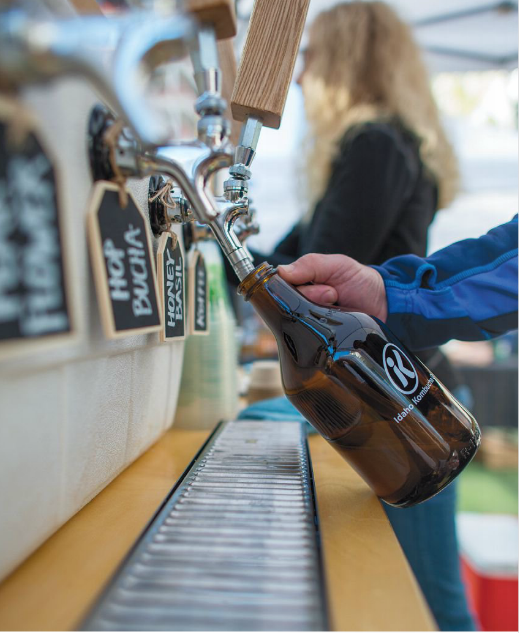 My third story in the 2015 Winter Edition of Edible Idaho explores the kombucha craze of the small batch, locally made variety as well as the national trend. Photos by the very talented Guy Hand as well as myself. Making kombucha is a bit like taking care of a pet. Though the SCOBY (symbiotic colony of bacteria and yeast) might not be the most attractive creature you’ve ever seen, this gelatinous, yellow-ish disk is the workhorse of kombucha (pronounced kom-BOO-cha). Its job is to convert tea and sugar into a lightly fizzy, slightly sour drink. According to Mike Landa of Idaho Kombucha, the SCOBY has to be fed, kept warm, needs to breathe, doesn’t like light and sometimes needs a bath. He stopped short of saying he takes it for a walk. 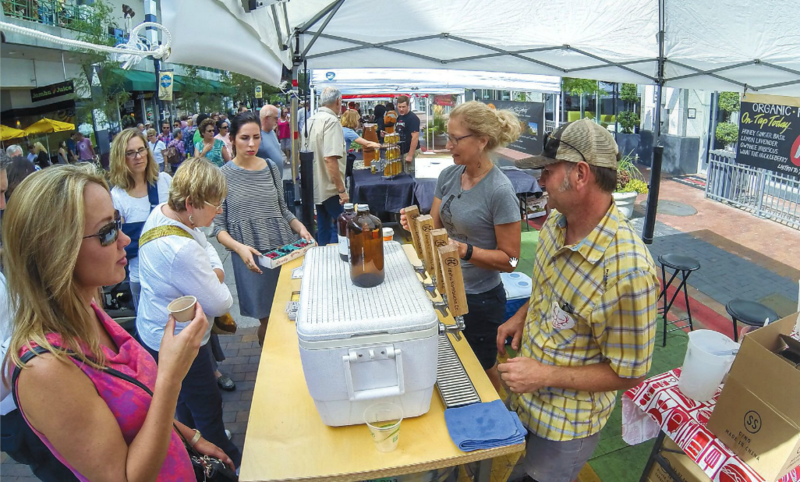 Landa started making kombucha 10 years ago and began producing it in a small commercial kitchen in Garden City in 2013. “I needed a source of income, which will happen someday,” Landa laughed. That someday may come soon, as kombucha is continuing to gain popularity. The beverage saw a 29% combined growth across all channels from February 2013 to February 2014, according to market research firm SPINS and it shows no signs of slowing down. Hannah Crum, co-founder of Kombucha Brewers International, predicts sales will top $500 million in 2015. What is a functional beverage? According to the medical dictionary it’s “A non-alcoholic drink that contains non-traditional ingredients, including herbs, vitamins, minerals, amino acids or added raw fruit or vegetable ingredients, which is claimed to provide specific health benefits beyond those of general nutrition”. The flavors often found in kombucha—everything from hibiscus to sage—can be infused in fermentation or added afterwards. Many functional beverages also tout health benefits, although not necessarily ones that are backed by the FDA. Kombucha’s claims include that it contains probiotics and enzymes, which aid digestion, and that it’s high in B vitamins. But health claims aside, Landa says it all comes down to taste. Kombucha is often thought to be sour or vinegary but it can also taste herbaceous, floral or sweet depending on which flavors have been added. Like so many other things, you might need to try a few before finding a favorite. 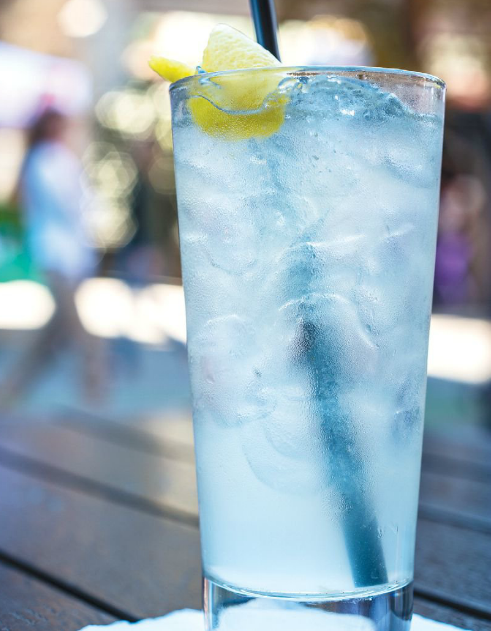 While fizzy like soda, the viscosity is definitely lighter and even though tea is one of the main ingredients, the finished product retains none of that brewed flavor. Where kombucha brewers got their first SCOBY is something they remember with the fondness of a first kiss. It’s also something that’s passed down like a family heirloom. Mike Sommer, of Purple Sage Brewing, received his first SCOBY in the mail from his sister. It was the summer he was working in Glacier National Park after graduating with his degree in Biology. He started making kombucha with wild herbs that he foraged – botanicals such as rosehip, bergamot and raspberry and strawberry leaf. When Sommer moved back to the the family farm in Middleton in 2009, he produced kombucha commercially which was sold at the Boise Co-Op and the farmer’s market. He took a bit of a break in 2013 but now with a new commercial kitchen at Purple Sage Farm scheduled to be done by the end of the year he plans to be back in the bulk brewing game “once the weeds stop growing and the harvest slows.” With a farm full of herbs, he has no shortage of ideas, or certified organic product, of things to make in the new kitchen including pesto, herbal teas, ready-to-eat salad greens, and fermented vegetables plus plans to produce a hard kombucha. Since this will be an alcoholic beverage Sommers is still researching what special licenses he will need, but hopes to release this new item in the first half of 2016. 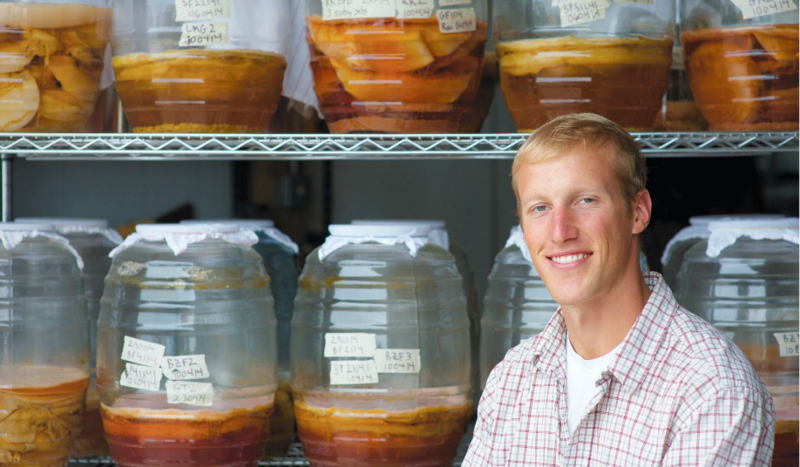 Gabe Yeamans of Boise Kombucha also got his start from a sibling. While Yeamans had been brewing for 10 years, it wasn’t until 2012 when his brother opened Hawaii Kombucha that he was inspired to go commercial. Starting Boise Kombucha was definitely a labor of love. Yeamans worked nights after putting in full shifts at his day job and invested every last penny he had. Not only did it take money but it took time – a year from deciding to go commercial till his first keg was sold at The Crux. Now he brews 140 gallons a month. Healthier it may be but that doesn’t mean you can’t have some fun with it and what would be more fun that taking something healthy and adding alcohol? When Kacey Montgomery of downtown Boise restaurant Juniper asked longtime friend Landa. “Do you think we could make a cocktail using Kombucha?” Landa was quick to answer “Yes”. The popular Lavender Lemonade kombucha cocktail on Juniper’s menu was the result. For some it might just take adding some hooch for some to try the booch. Healthy and boozy are two of Linda Whittig’s favorite food groups. Get more of both types of recipes at BistroOneSix.com. Pour first 3 ingredients into a cocktail shaker filled with ice. 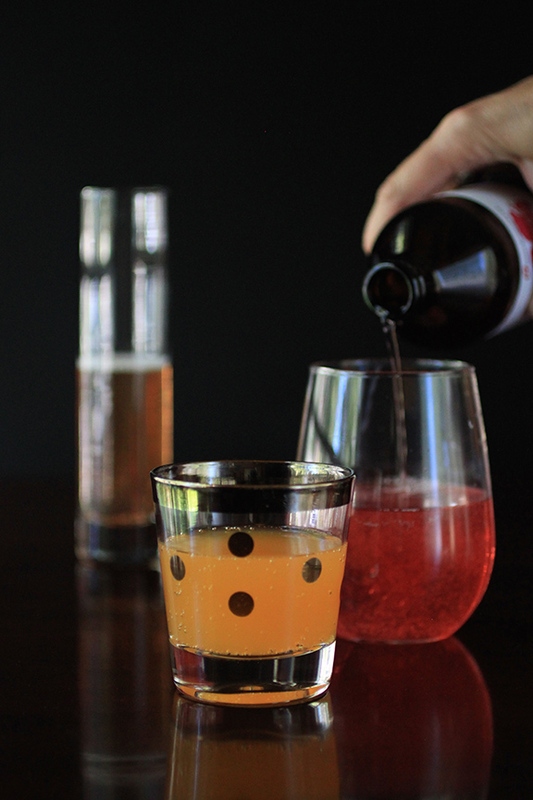 Top with Kranberry Orange Kombucha and garnish with lime or orange. In a glass, combine blackberries, lime juice and mint simple syrup; lightly crush berries to release juice. Top with Blackberry Fig Kombucha and garnish with mint. Combine vodka, lime juice and simple syrup (if using) in a glass. Add ice and top with fresh Ginger Kombucha.